Party bus rentals for Halloween are the rage! What a better way to keep yourself safe from the Ghouls and Goblins during the Halloween season. Heading to a Haunted House or 2 for Halloween? Why not take a Halloween Party Bus and make it a Haunted House crawl through Oakland county? Maybe you have an invite to a private Halloween party, or have tickets to attend a Halloween party at your favorite pub or night club? Your options for the perfect ghastly night on the town enjoying all of the Halloween festivities are ENDLESS- like the life of a Vampire! Taking a Party Bus Rental for Halloween helps avoid the evil ghosts and goblins and any bad weather too. Preserving your Halloween costumes and keeping you warm in case it’s a cold night out like it’s been for the last few Halloween weeks is the perfect plan. Who wants to wear a coat over their Halloween costume, or wants their wigs wet or their make-up running like a scared child? At Varsity Limousine Services, we take pride in getting you to your Haunted destinations with our Halloween party bus rentals on time so you won’t miss a single scary moment! 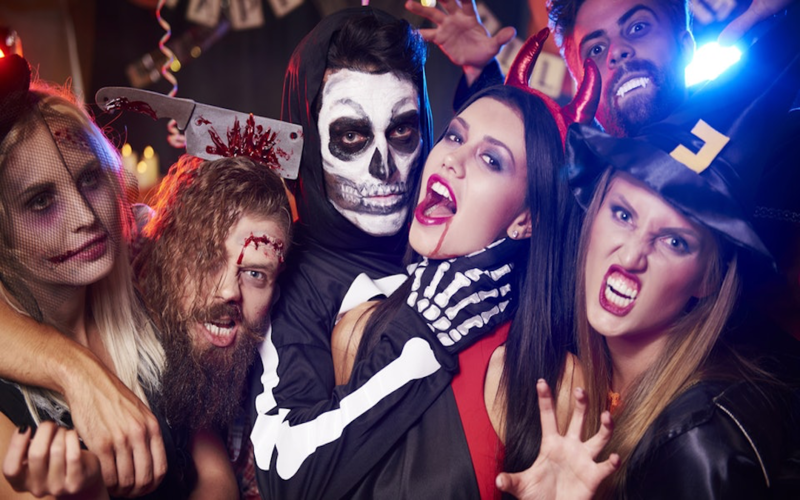 Check out our party bus rental fleet and view other limo transportation options for groups large and small- visit our Party Bus and Limo Fleet page today for a Halloween experience you’ll never forget!